I’ve been a little more quiet around these parts than usual lately, but that doesn’t mean that I’ve completely disappeared. I’ve been taking a little breather from the constant social media cycle that can come to feel endless and draining–blog posts, moderation of our Facebook groups, Instagraming, etc. Over the next few months I’m going to be focusing more of my efforts on developing our new fall pattern styles and tending to family, so you might hear a little less from me than usual. But that doesn’t mean I’m not here! But today I’m back with a short weekend links post to share with you. So here we go. Two very elegant women, both shot by the Sartorialist. Style goals, right? A little color inspiration for spring. 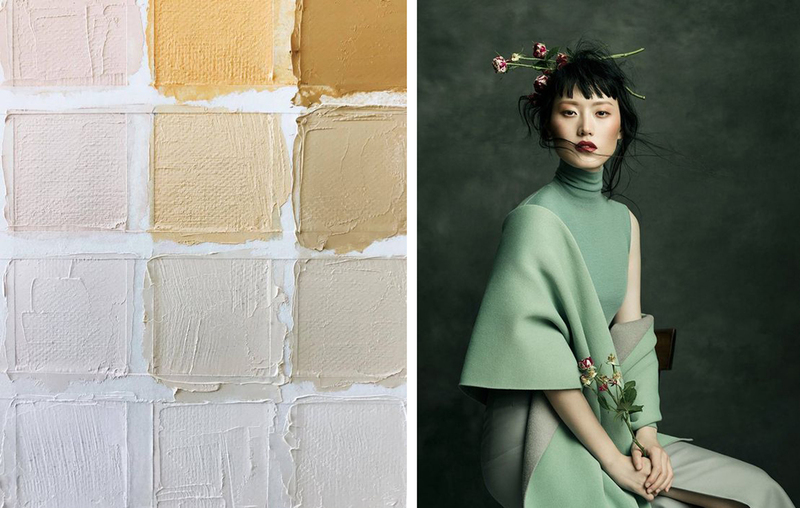 I love the soft neutrals, but especially that green with beige! And just for fun: a very happy guinea pig and the best bike helmet ever! It makes me ridiculously (and unreasonably) happy to know that basketball players have legs again. Feeling slightly obsessed with these amazing dishes. Hurray for new-and-improved hospital gowns! Just another great reason to sew something this weekend. It’s good for your brain! Madrid is home to the oldest restaurant in the world. And it’s in our neighborhood. How crazy is that? My favorite Givenchy design has always been the gown Audrey Hepburn wore for the party scene in Sabrina. What about you? Have a wonderful weekend, and I hope you sew something fun! Some of you have already started posting photos of the new spring patterns and they look wonderful! Please keep them coming. I love to see what you’re making! I’ve been to Botin and it was wonderful. But no, I did nothing have the nerve to order the suckling pig. Those poor little things just kept on coming out of the kitchen! Ha ha! Todd ordered it once, and S and I put a big menu between him and us so we wouldn’t have to look at it. I just can’t. I’m not sure I could do those ant dishes. They are a bit too realistic! I totally get it, but for some reason that’s what I love about them! Have a good weekend. Enjoyed all your links. Especially Botin!!! We enjoyed a lovely afternoon at that restaurant!! And….fabric shopping!!! Pics of both on my blog….under…Chaotically Precise…Travel chaotically – To Spain with love. Thank you for including the article on Givenchy. It was very interesting reading! I adore fashion history.